All Kayenta homes currently listed for sale in Kayenta as of 04/20/2019 are shown below. You can change the search criteria at any time by pressing the 'Change Search' button below. If you have any questions or you would like more information about any Kayenta homes for sale or other Kayenta real estate, please contact us and one of our knowledgeable Kayenta REALTORS® would be pleased to assist you. "Due to it's private location, views and irreplaceable landscape, this home underwent a 400k remodel and upgrade in 2016. Nestled into a hillside with acres of open space, you enjoy unobstructed views of Kayenta, Utah Hill, the Arizona strip, and all the waterfalls that Kayenta cliffs are known for. This 3191 sq. 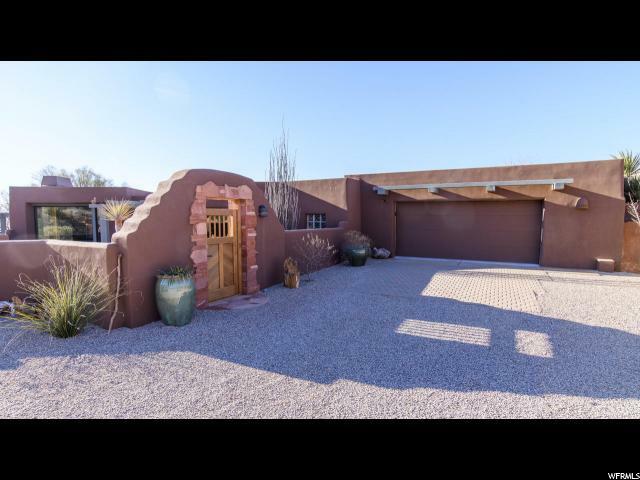 ft. southwestern style home includes 3 bedrooms, 2.5 baths, great room, den/office and guest en suite kitchenette. All rooms were laid with 8 wide 6 ft long planks of smoked French oak flooring. Custom tile work and quartzite countertops in all baths, kitchen and fireplace surrounds makes this home a one of a kind. Two natural gas fireplaces, one decorative electric fireplace and sandstone rock accents create a home with cozy and comforting ambiance. The kitchen is appointed with a stainless steel Miele suite including a 6 burner natural gas cooktop, 2 side-opening double ovens and warming drawer and a whisper quiet dishwasher. Set the mood in any room using dimmable recessed LED ceiling, fan, and undercounter lights. Enjoy the red rock walls and magnificent sunrises and sunsets through oversized wood windows and/or glass doors from every room. Marvel at the amazing stars in the dark sky community during the quiet evenings on the patio around a custom designed natural rock firepit. Unique desert landscaping on large private 1.33 acres. Enjoy 1 of 3 patios that provide over 3500 sq ft. of trellised and partially covered outdoor living space while listening to water cascading over the natural rock fall feature of a spa-pool. A great place to entertain family or friends, barbeque or take a dip on a warm afternoon. You will never want to leave..."